We are excited to announce that we are a Kimberbell Certified Shop. We will be offering fun classes all year! 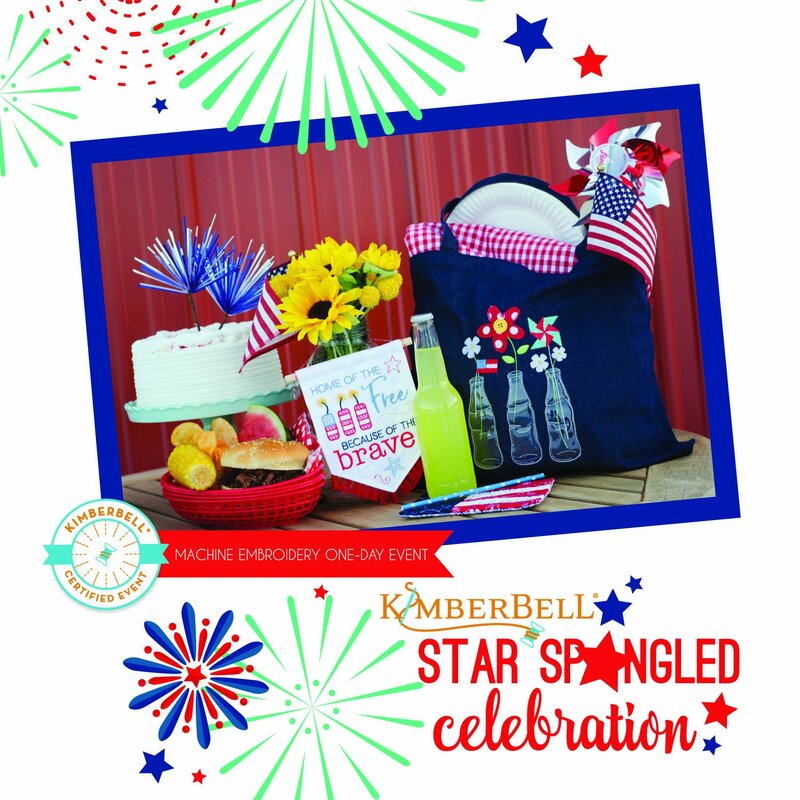 We are kicking off the season with Kimberbell's Star Spangled Celebration. Join Anne Beale Yancey, our Certified Kimberbell instructor, during our machine embroidery event. Two dates to choose: Friday, June 7 or Saturday, June 8. It is going to be a party! You will make three exclusive projects: Home of the Brave Pennant, Sweet Liberty Mug Rug, and All American Celebration Tote. You will receive the Kimberbell project kit with fabric, denim tote, all embellishments, detailed instructions and design CD. Lunch will be provided. Improve your embroidery skills and learn new techniques. Be inspired by friends who love to embroider like you! If you are new to embroidery or have been stitching for years, everyone is invited to our patriotic party! To help us make your Kimberbell experience the best it can be, please download the REGISTRATION FORM and supply list and return the completed form to Dublin Sewing Center. The form can be completed on your computer and emailed back to us at dublinsewing@comcast.net or returned in person. Students must have basic embroidery machine knowledge. Embroidery machine must be in good working order. Bring machine, embroidery unit, all necessary embroidery accessories, matching thread, a 5 x 7 hoop, and a 6 x 10 hoop. Please arrive by 9:45 to set up your machines! Try before you buy during this event! Don't own an embroidery machine? Thinking about purchasing one? This is the perfect event to attend! We will have a limited amount of machines available the day of the event to use. Please call store for details. Students must have basic embroidery machine knowledge. Bring embroidery machine, embroidery unit and all necessary embroidery accessories. Embroidery machine in good working order. You will need matching threads, 5 X 7 hoop, and a 6 x 10 hoop. Price includes Kimberbell kit, designs, lunch.